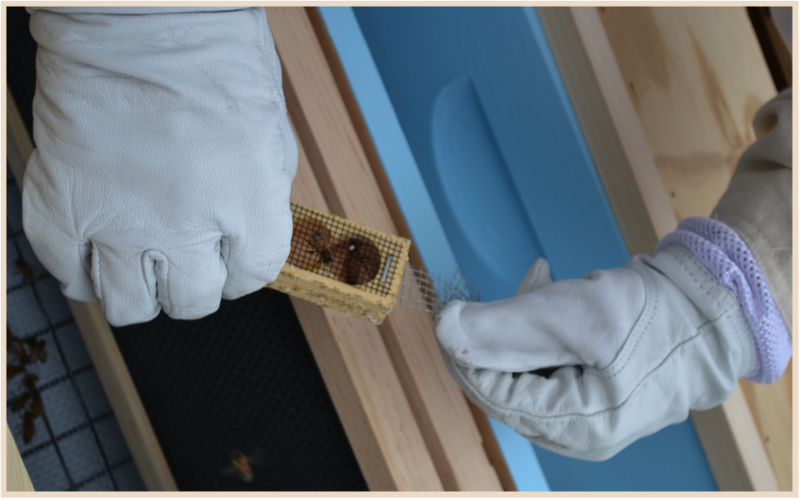 From 2011 when I first became a beekeeper, reposted here and taken from my previous blog on iWeb. BEFORE I LOST MY TWO HIVES FROM MOSQUITO SPRAYING IN MY TOWN. See addendum at bottom. 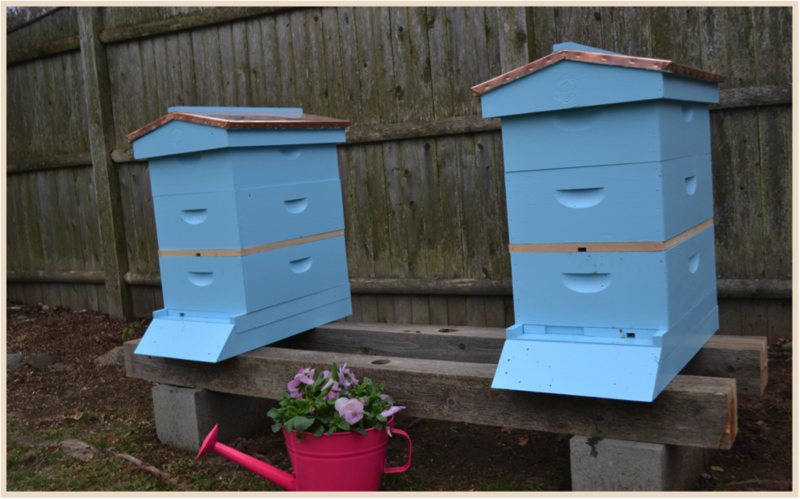 I had been thinking about keeping honey bees for some time now, and this winter I decided to go for it. What was I waiting for? (I’m not good at waiting anyway) Because of CCD, Colony Collapse Disorder, mosquito spraying, and increased consumer pesticide use the honey bees need our help. Since 2006, honey bees have been mysteriously disappearing. There are many theories out there, mostly related to heavy pesticide use on big, monoculture farms but no one is completely sure what the cause is. However, scientists agree that something has to be done to save the honey bee. One-third of the food we eat is pollinated by the honey bee. One-third! It’s very alarming to think what would happen to our food supply if we didn’t have the honey bee. I also learned that almond growers in California utilize migratory beekeepers to pollinate, using 1.3 million colonies of bees (HALF of all honey bees in the US) that are shipped there every year. I recently watched a new documentary, narrated by Ellen Page, titled Vanishing of The Bees. I highly recommend you get your hands on this or find a local screening and see what is happening all over the world. It’s heartbreaking. And scary! One hopeful part of the movie is learning that Germany and France banned the use of the pesticide Clothianidin (a neonicotinoid) and within a year the honeybee colonies began to come back. Not so in the United States. I always thought I needed acreage and farmland to keep bees, but I was wrong. There are many backyard and city beekeepers. Most are self-proclaimed “closet” beekeepers. And since lifting the ban on beekeeping, New York now has a high, and growing, number of roof-top beehives. At a recent Essex County Beekeepers Association (ECBA for short) meeting I was told that there were 1,000 new beekeepers last year in Massachusetts. Impressive and hopeful numbers for sure. You probably have beekeepers in your neighborhood and don’t know it. Beekeepers usually don’t advertise their hives because neighbors are misinformed and can get anxious. But there’s no need to be anxious. Be thankful. We need the bees. Your trees, flowers, and vegetable garden need them. They selflessly work themselves to death tending to the needs of the colony. And aren’t we lucky to get our plants and trees pollinated and receive health-giving honey and beeswax in return? Honey bees are often lumped into the same category as wasps and hornets. Yellowjackets, Bald-faced hornets, and other species of bees do not have barbs on their stingers and can, and will, sting you repeatedly if you get too close to them or their nest. My husband was a target of nasty Bald-face hornets last year when he accidentally disturbed their basketball-sized paper nest in one of our bushes. 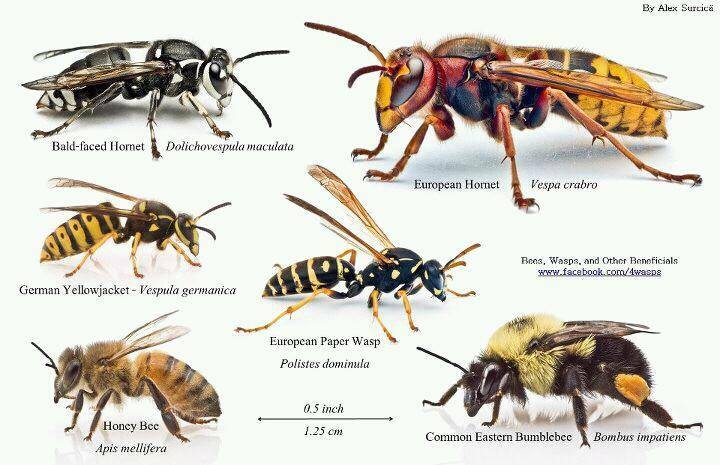 Wasps and hornets are more aggressive than honey bees and they are omnivores, too. Wasps and hornets are the unwanted visitors that join your backyard barbecue and eat your grilled food and sip your sweet tea. A honey bee will NOT do that. They’re too busy finding nectar. A honey bee will only sting to defend the hive or itself. A honey bee will die after stinging because their stinger has barbs. Their insides will come out as they try to fly away because the barbed stinger is stuck in your skin. Only the worker bee (a daughter of the queen) will sting. Queens don’t leave the hive to defend it. Drones don’t have stingers. A hive consists of a Queen, female worker bees, and a few drones. Drones don’t work, they have to be fed by the worker bees, and their only job in life is to mate with a Queen (if they’re lucky enough to find one). If a drone does mates he quickly dies because his mating parts get stuck in the Queen. A swarm of honey bees is docile. They are surrounding and protecting the queen while the scout bees look for a good home. The temperature inside a hive, around the cluster, is a constant 93°. On a hot day, worker bees will position themselves just inside and right outside the entrance and fan their wings to create airflow, much like a fan. Honey bees come out of the hive about 8-10′ and then they fly up, up, up over an area of up to 5 miles to find the best nectar and pollen sources. Honey bees return home in the evening. 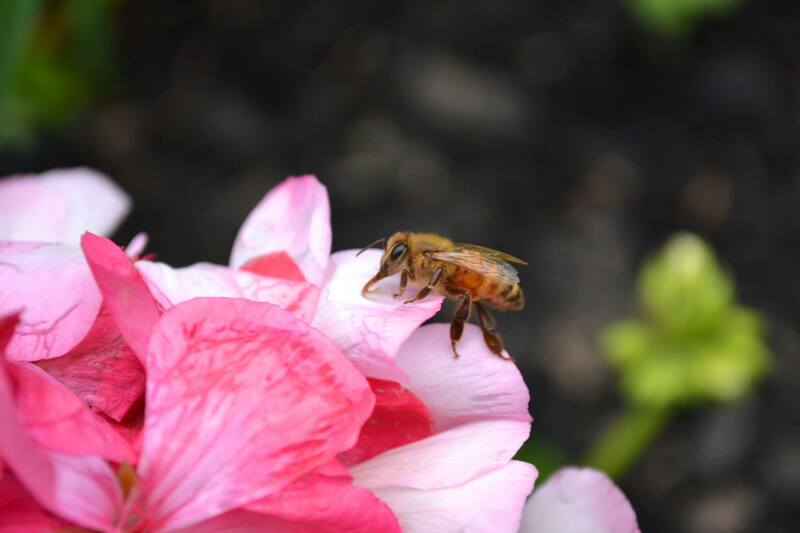 Honey bees have species fidelity – they find one type of flower and will stick with it. Other types of wasps and bumblebees will fly from flower to flower no matter what the source. A worker honey bee produced a few droplets of honey in her short six-week lifetime. A Queen honey bee can live up to 5 years and lays about 1,500 eggs a day during the warmer months. People have been collecting honey for 10,000 years. Cave paintings from Spain depict ancient beekeepers climbing to get to the hive. The word “honeymoon” comes from medieval Europe when a traditional gift of honey mead, enough to last one moon cycle (a month), was given as a gift to newly married couples. It literally was a moon of honey. Honey was once used as currency. Honey is used on burns for its healing qualities. Honey is antimicrobial, anti-inflammatory, and full of antioxidants. Honey contains enzymes, minerals, and vitamins. Honey is hygroscopic. It attracts moisture, making it great for your skin. Honey Bee Hobbyist, by Norman Gary, Ph.D.
** Watch Harvard Professor Dr. Lu discuss CCD and pesticide use in MA with Essex County Beekeepers HERE, courtesy of Marty Jessel, Essex County beekeeper. PS: Essex County has the highest level of neonicotinoids, the systemic and cumulative pesticides that are known to kill honey bees and other pollinators. ** Hear Dr. Lu on The Neonicotinoid View: Harvard’s Dr Lu Discusses Pesticide Exposure & Health Risk HERE. ** GARDENER’S BEWARE! Friends of the Earth sampled plants from box stores. Your bee-friendly garden may not be so friendly after all. Please watch HERE! ** HERE is a list from the Center For Food Safety of common products that consumers can purchase that contain bee-killing neonicotinoids. You may not even be aware that what you’re putting on your trees, roses, lawn or garden is creating a toxic wasteland for pollinators. 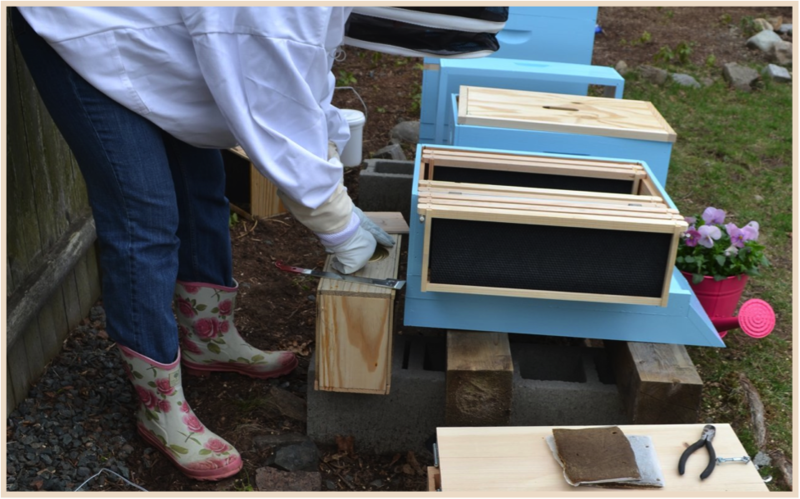 There is growing group of beekeepers and concerned citizens working for change at the city, state, and country level. Things will change if we work together. If you are interested and willing to join in efforts to protect pollinators, please contact me. A Call to Action! Save the Pollinators!